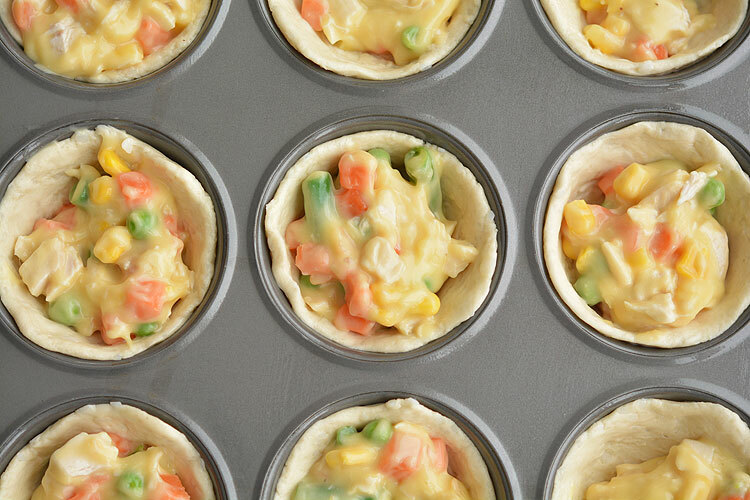 These mini chicken pot pies feel like comfort food to me. 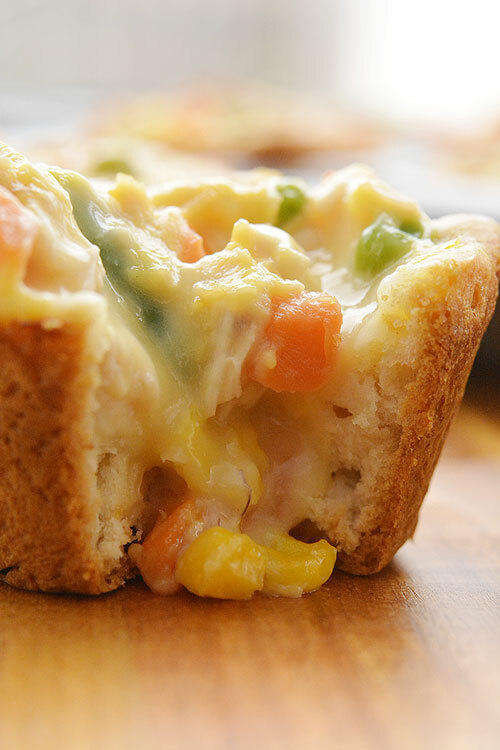 Somehow, the combination of chicken, veggies and fresh biscuits smells soooooo good when it’s baking! And that perfect, golden brown crust, and bubbly filling? 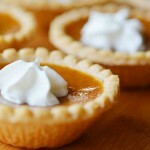 Mmmmm… so good when they are fresh out of the oven! Only 4 ingredients! I love how easy it is!! If you prefer the taste of crescent roll dough, you could definitely use it instead of the biscuit dough. The biscuit dough comes in individual circles though, so it does make it a lot easier than fussing with cutting circles from the crescent roll dough. 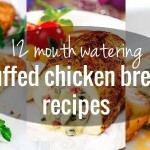 This is a GREAT recipe for using leftover chicken! You can use a rotisserie chicken, leftover home cooked chicken, or if it’s easier, just fry up a fresh chicken breast and chop it up. 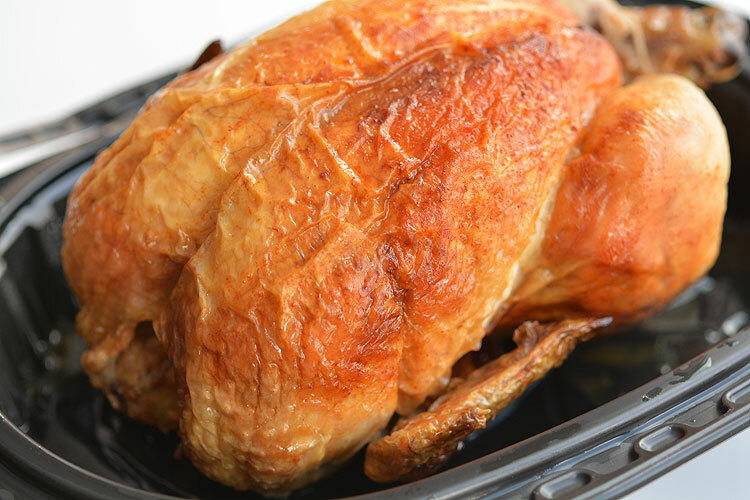 If you’re really in a hurry, you can also use a can of chicken (I like the canned chicken from Costco), but it does taste better when you use fresh or leftover chicken instead of canned. Buy a package of the frozen vegetables with carrots, peas, green beans and corn. And make sure it is mostly defrosted before you cook it. I defrosted mine at 20% power in the microwave for about 5 minutes. 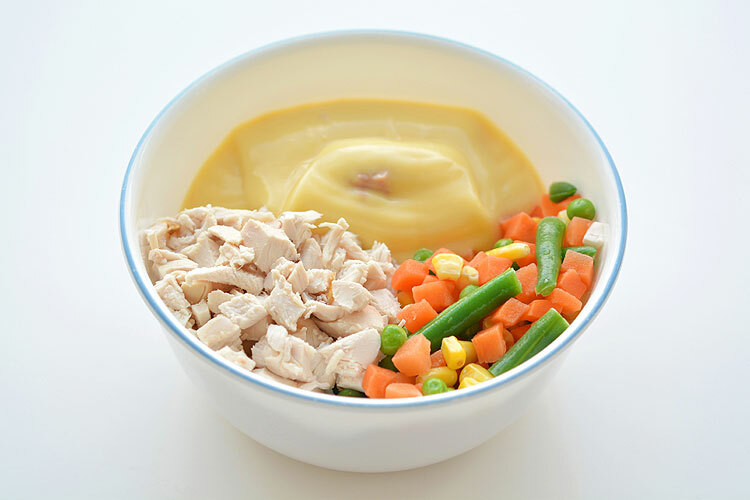 Mix together the can of cream of chicken soup, the mixed vegetables and the chicken. 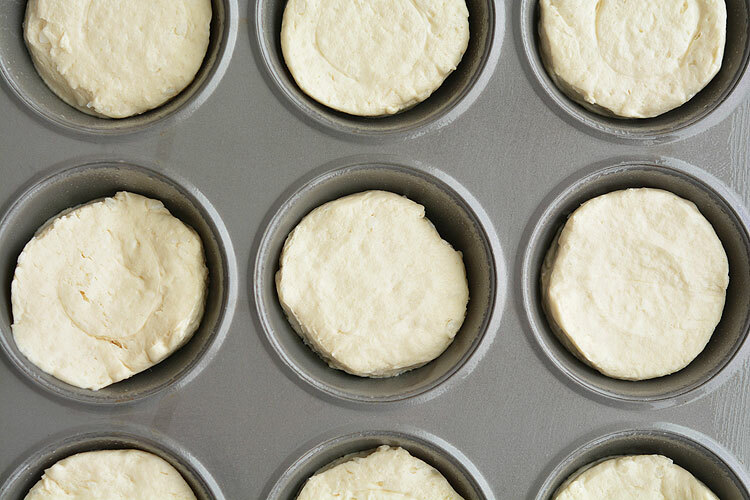 Separate the biscuits and place them into a greased muffin tin. 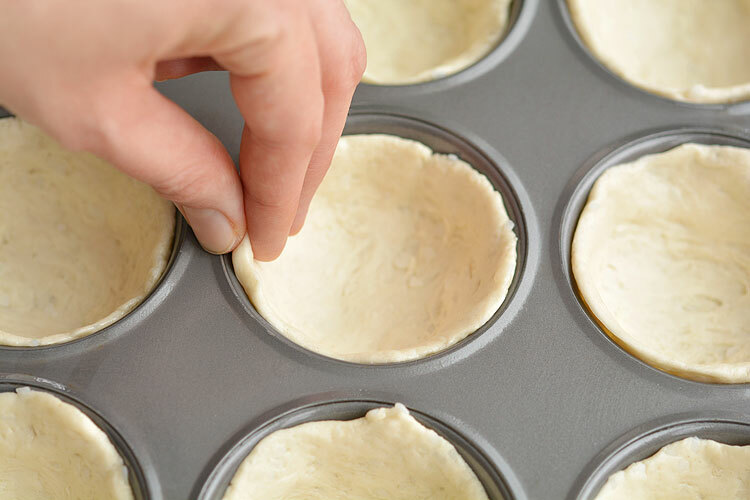 Use your fingers to press down the middle of the dough to thin it out, and then stretch the dough up the sides of the muffin tin as high as it will go. I ended up stretching out the dough twice, letting it rest a couple minutes in between. Then add the chicken filling inside each of the cups. I added about 2 tablespoons into each of the mini chicken pot pies. Bake them at 375F for 20 to 25 minutes until golden brown. Use a knife to cut around the edges if they stick. Mine came out really easily, but it will depend on how much of the nonstick coating is left on your muffin pan. If you’ve scrubbed off most of the nonstick coating, make sure you use some extra cooking spray to keep things loose. Definitely keep an eye on them while they are cooking and when they start to brown, take them out of the oven. I kept mine in the oven for probably 2 minutes too long and the sides ended up being a little darker than I wanted them. Still delicious though! 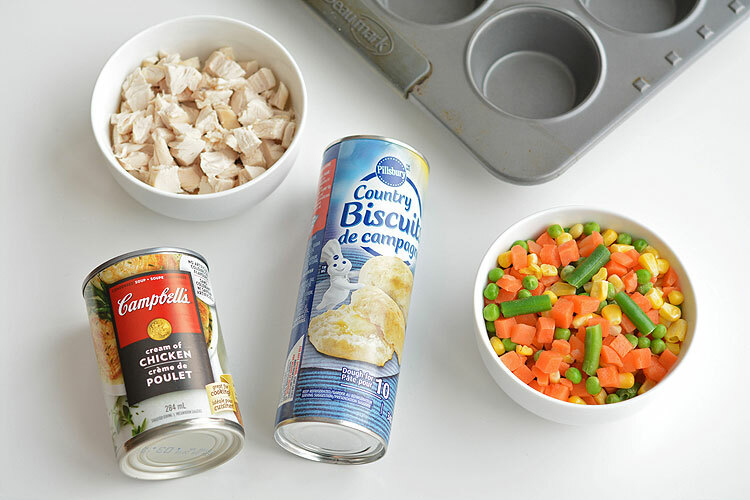 These mini chicken pot pies are ridiculously easy to make! They only take four ingredients and come together in less than 30 minutes. 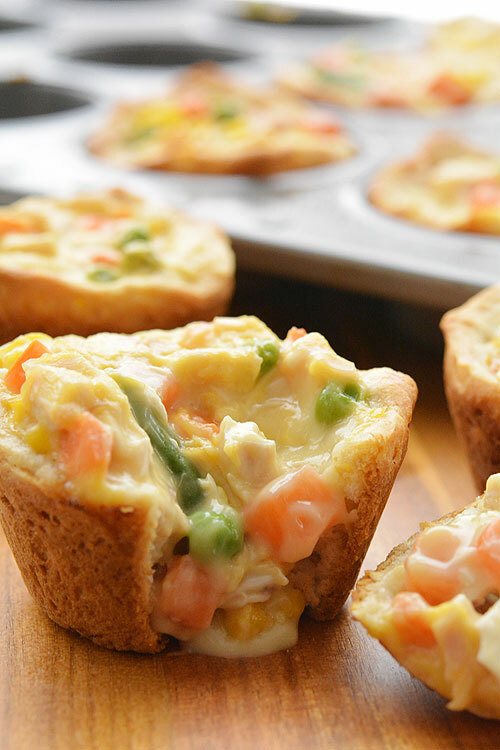 These are such a fun and delicious meal idea when you have a craving for comfort food! 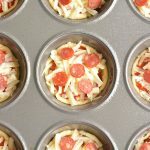 If you’re looking for more fun recipes you can make in a muffin tin, check out our deep dish mini pizzas. 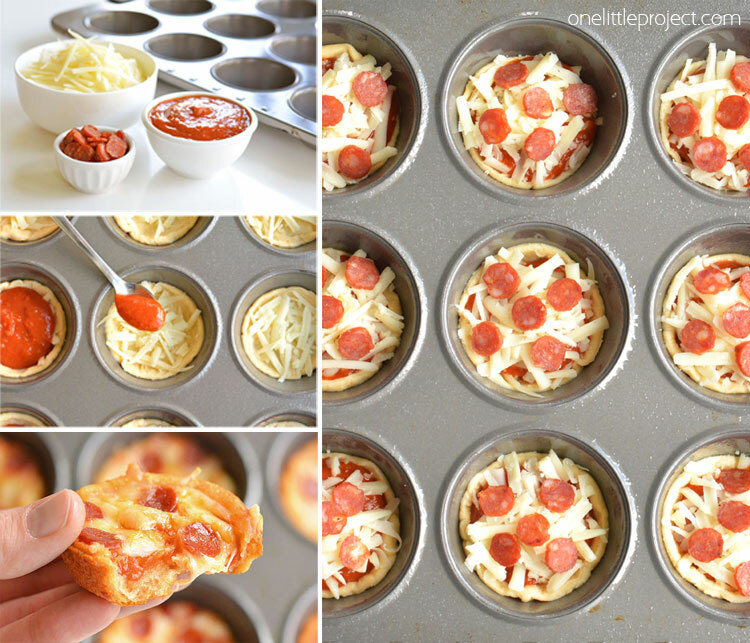 These are super simple to make, they taste delicious and you can add all your favourite pizza toppings! This is a brilliant idea! Made it for dinner tonight, and it wasn’t a hit! I made this tonight and it was DELICIOUS!!!! Thank you for sharing this meal. Hello! 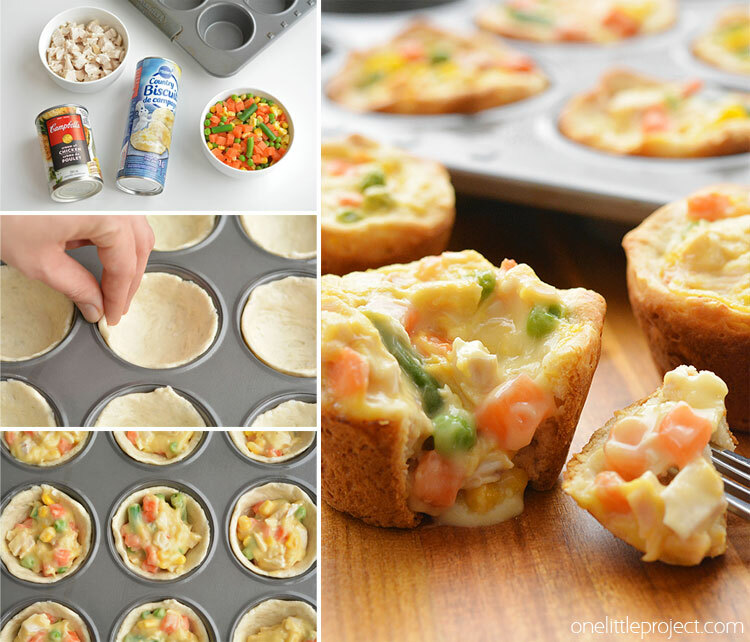 Do you make these in normal muffin tins, or did you use mini muffin tins? 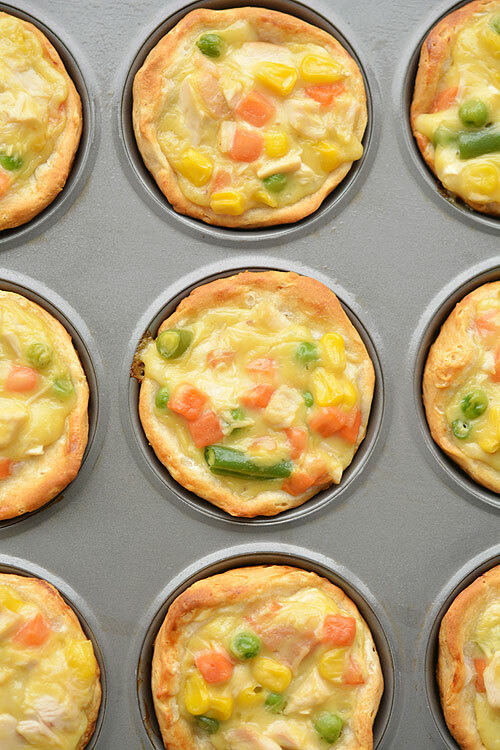 Can you fold the dough over the top to make them covered, like reg pot pies?? Cooking times the same? Hi! Do you have the nutritional information for these? 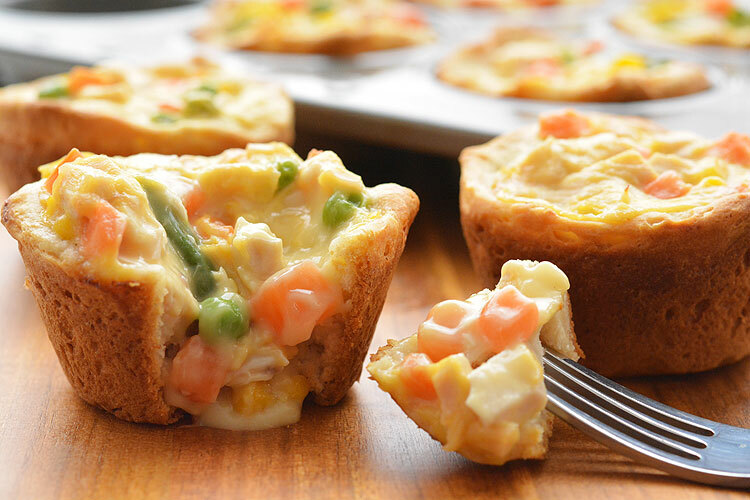 Was thinking of making these for a potluck lunch. Can they be reheated in a microwave? Just saw that they can be reheated. Can’t wait to try them. Very good and very easy. The whole family loved it! Will make again. Thanks!!! Are these regular muffin tins or mini? Just made these for supper. I was going to double the recipe, so I chopped up 1 1/2 C of chicken. I put in the cream of chicken w/herbs but then decided to just add 1/2 can of cream of celery. Then realized I only had 1 C of the veggies. Well, I mixed it all together with garlic powder, onion powder, celery seed & black pepper and they turned out great! The ‘other 3’ loved them too. Oh, I did cut the biscuits in half, as others suggested. YUM! These were so good! I followed the recipe exactly and they turned out great. I will definitely be making them again. I made these for dinner and tried both crescent and biscuit dough and I have to say the biscuits are better. Even my son who hates vegetables liked it. I would recommend this recipe to anyone looking for a quick and easy dinner solution. Besides, who doesn’t like chicken pot pie? I enjoyed it very much…. Your recipe is really very awesome!! Thanks for sharing it with us. Keep helping us. How do you keep them warm for several hours without microwave? ?? Anyone tried this with something other than cream of chicken soup? I was thinking of using cream of mushroom to avoid a trip to the store. I used pillsbury grand muffins because it’s all the store by myself had. They overflowed and turned out huge, but they still tasted great! 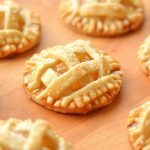 Can you use pie crust dough? And also cover the tops as well? Looks yummy! 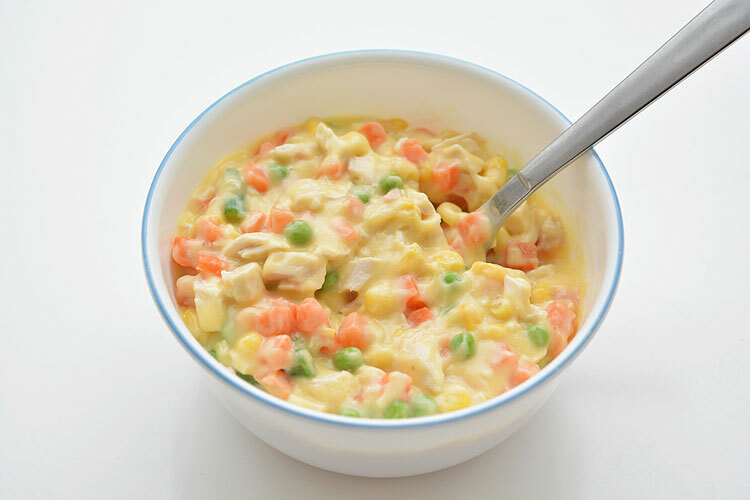 I’ve made a similar recipe– that called for Cream of Potato soup (instead of Cream of Chicken) which was so delish with the tiny bites of potato in the Pot Pie!